Every morning, A wakes in a different person’s body, a different person’s life. There’s never any warning about where it will be or who it will be. A has made peace with that, even established guidelines by which to live: Never get too attached. Avoid being noticed. Do not interfere. And then A wakes up in the body of Justin and meets Justin’s girlfriend, Rhiannon. From that moment, the rules by which A has been living no longer apply. Because A has found someone he wants to be with—day in, day out, day after day. Can you love someone who is destined to change each day? 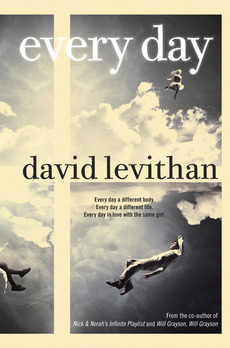 YA superstar author David Levithan brings all his trademark insight to a novel that is edgy, romantic and page-turning. Every Day has a touch of the paranormal and a grounding in the real world. OK, this is a 'Wow' book. An amazing concept, told as an amazing love story. It's one of two books I have on my list this month that makes you think about what makes us, 'us'. This story also makes you think about what it is about a person that we actually fall in love with. Imagine having the best day ever with your usually not so great boyfriend, and the next day he's back to his normal not so great self. Imagine then, that you find out that the person you spent the amazing day with is actually not really a person at all. That is what Rhiannon has to deal with. The person she has fallen in love with is actually 'something' that inhabits a different body every day. The story is told from the point of view of 'A', the 'person' who moves from bodies from day to day. Throughout its 16 years of existence, it (A is neither male or female) has made a point of never making any attachments, and leaving the bodies without having made any dramatic changes. All of this changes when it meets Rhiannon, and for the first time A wants to be with someone. So this is the story of how A explains to Rhiannon what he/she is and convinces her that it's real. We see A's life through the eyes of many different characters, getting glimpses of many different families, and A's aim each day is to get to Rhiannon. Some days A will wake up hours away, so meeting is difficult, if not impossible, a good day is when A is only minutes away. Some days A is a girl and some days a is a boy, some days A is gorgeous and some days A is a long way from gorgeous. It may be difficult for A, but for Rhiannon it's more that just logistics. For one, the being together depends on where A wakes up in the morning, secondly she has to adjust to an entirely different person every time they meet. In theory Rhiannon knows that it's what's inside that she loves, but the different bodies and different genders become more and more of a challenge. The secondary storyline is about Noah, a body that A inhabited who finds himself stranded by the roadside when he woke up. Noah had no memory of the night before, and he claims that he was possessed by the devil. This creates a lot of media attention that just gets more crazy when the church get involved. While the storyline is different to a book like Time Traveller's Wife, it feels like the same sort of story, A big love, where two people can't be together in a 'normal' sense, but will do whatever they have to, to make it work. I can't (won't) give away the ending, but I will say that it's a satisfying one. The thing that I found interesting, is that what A is, was never explained. We don't know if its a soul, a spirit or even an alien life form. As an Australian reader I did question why A only inhabited bodies in the US, and why were they only within a 4 hour drive from Rhiannon. I am happy to say that this is actually explained at one point, when A avoids a family holiday to Hawaii in one particular body.